The first step is to work out your design, I went on the internet and looked up pictures of surfboards. Select the style of board you want (the shapes differ a bit) and you can print it out and enlarge it or free hand it to get a template for your cake which you need to cut out. Once you have your surfboard template, print out or draw up a template for some fins proportionate to your surfboard size. **Note: The fins need made in advance so they can dry hard. 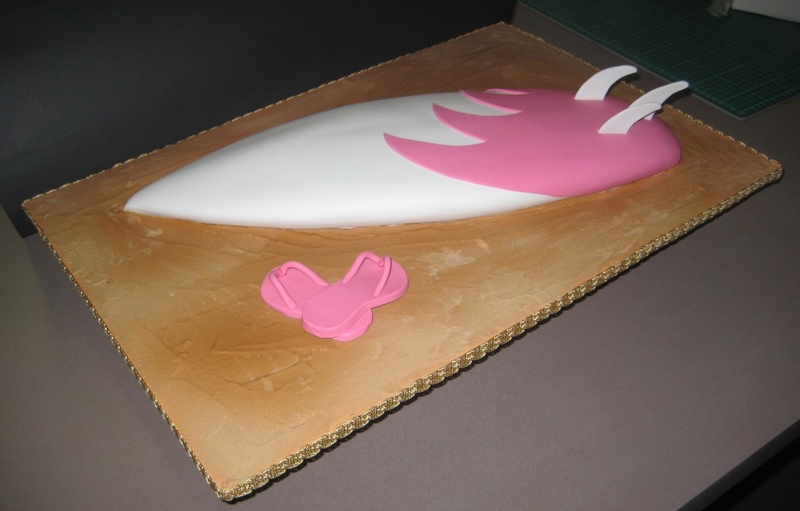 Roll out some modelling paste, flower paste, pastillage or fondant with a hardner added such as Tylose or CMC fairly thinly and cut out 3 fins using the template and set aside to dry. How big you make your template depends on how many people you want to feed with your cake. You also want to think about the cake tins/pans you have in your kitchen and select a size that works with your tins. 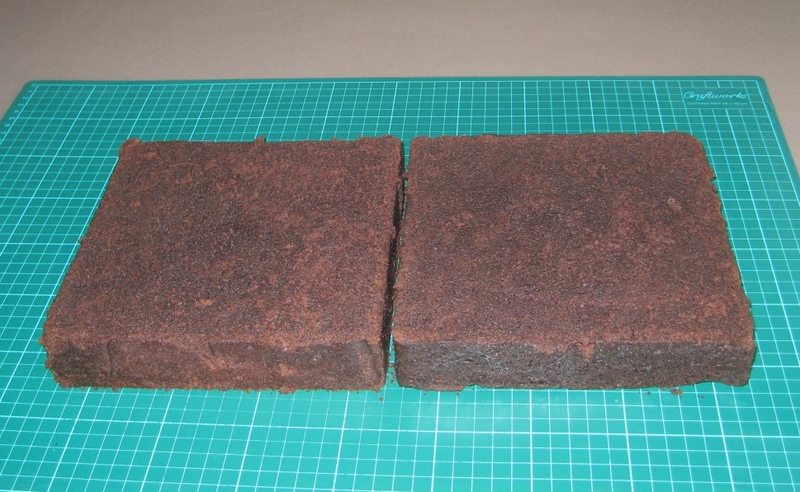 You will need either a rectangle or 2 squares ( if you bake your cakes high you can get away with 1 square torted into 2). I used chocolate mudcake because it is excellent for carving and delicious. 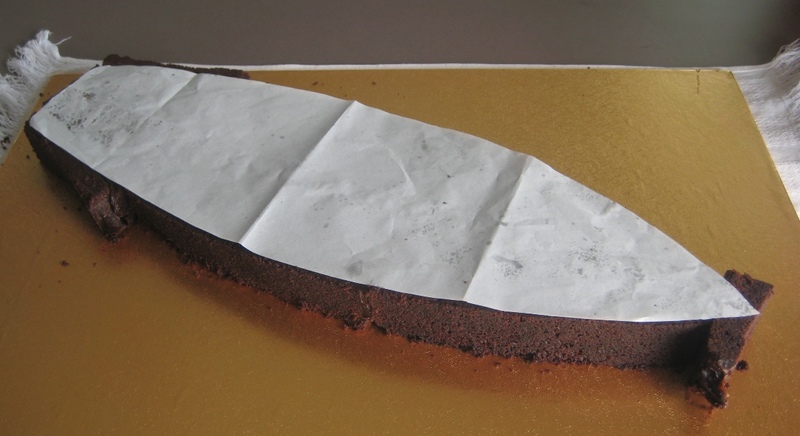 You don’t have to use mudcake but a denser cake is generally easier to carve. **Tip: You want to minimise waste as much as possible so trace around the bottom of your tin and move your template around and try to work out a way to reduce offcuts as much as possible you will see an example of how I did this below in step 3. Place your template onto your cake, my template was longer than my cake so I made 2 and cut one shorter (but you could just fold it up) when I did the initial cut I then used the off cuts to add the length I needed for the bottom of the board. 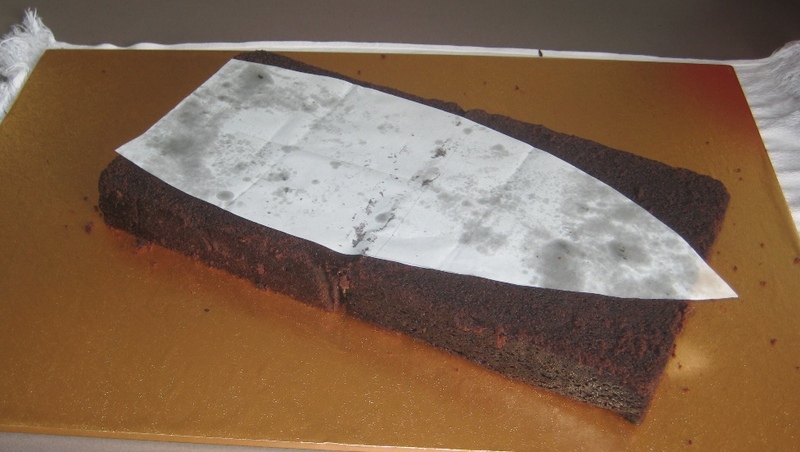 Stick all the pieces of cake together with icing (I used chocolate ganache) and place you full length template on top. You don’t have to do this step if you don’t want to (you could just freehand it) but I wanted to be sure I got the curves of the board right so I made some side templates after looking at side views of surfboards. 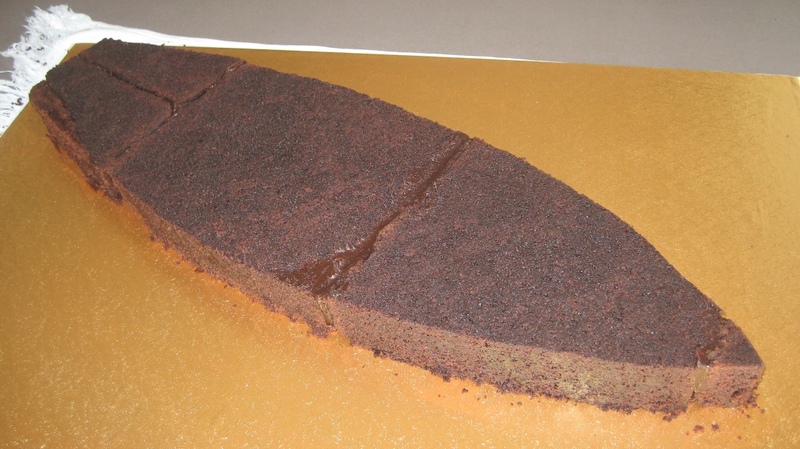 Using a sharp knife carve the top of the cake so that the sides match up to the top of the side templates. You want to end up with a gentle curve. On the top edges of the cake you want to bevel/curve them so slice off thin pieces holding you knife at an angle to create the nice curved edge. 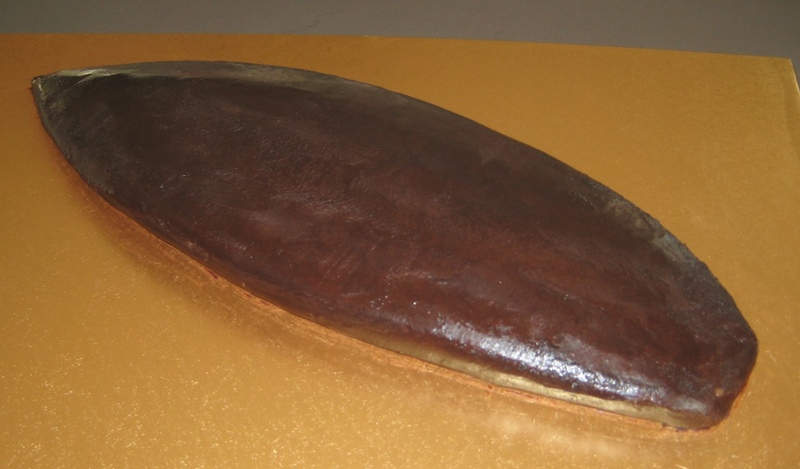 So that the surfboard looks realistic you also want to slice into the bottom of the cake (where it meets the board) at an angle to remove wedge-like pieces so it looks like to curves all the way from the top edge to the underside. I use ganache under fondant for my cakes so I will refer to that but you could use buttercream or whatever you usually put under your fondant. Grab a spatula and cover the cake with ganache trying to maintain the nice curved shape of the board. Have some hot water on hand and dip your spatula in the hot water and wipe it dry then use the hot spatula to help smooth out the surface of the cake. I won’t go into a lot of detail about how to cover a cake in fondant as there are plenty of tutorials on that topic on the internet already. You need to measure the widest part of the board from the underneath edge up over the top and to the underneath edge on the other side to get your width and then same lengthways to get your length. You need to roll your fondant out to at least a little bigger than the measured size. Place the fondant on the cake and working quickly smooth it out around the shape. Use a fondant smoother or a piece of acetate (or a piece of fondant pinched up to make a handle/something to hold on to and use that as a smoother). 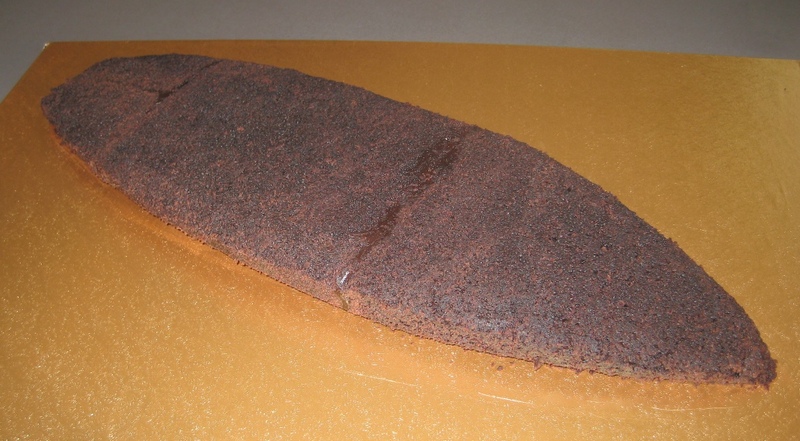 Now its time to get creative, decorate your surfboard cake with whatever design you like. 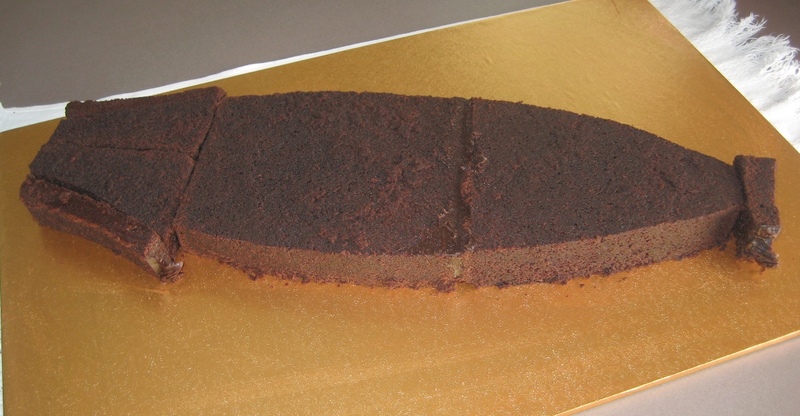 Cut 3 slits into the top of your cake for the fins and insert the fins into the slits pushing them down a little. If they won’t stay on their own you may need to secure with a little royal icing. For the board you can make it look like sand like mine or perhaps water using buttercream, royal icing and/or piping gel. You can add anything beach or surfing related to give your cake that little bit extra. I added some thongs/flip-flops which were just made by kneading in some Tylose or CMC to the fondant and then rolling it quite thickly and cutting out some almost jelly bean type shapes but a bit less exaggerated. Poke holes for the straps and then roll a sausage and cut 2 lengths for each one. Using a paintbrush wet the inside of the holes and poke the fondant straps inside. Use a bunched up piece of plastic wrap or something else to hold the straps up until they dry. They can be attached to the board with royal icing.